We arrived at Watergate Bay on Thursday morning, following a week of looking at the Magicseaweed.com web cams and surf reports that went from perfect to 25ft, then back to 6ft wind blown slop. Thursday was windy but with a 3-4ft swell running, myself, Gareth Grant, Simon Bassett and Holly Bassett got in the water for a warm up session. Both Gareth and myself were trying new low volume boards, which proved to be challenging in the windy conditions. Friday morning brought even more wind, although the swell had picked up. Simon and Gareth ran a coaching session in the morning, while I spent the morning in the luxury of a hot tub at the Watergate Bay Hotel, feeling depressed at the state of the wind. I had finally decided to go for a surf at 3pm when out of the blue the wind did a 180 degree switch and went offshore. The swell was well overhead and for about 2 hours a pretty good session was had by all, as more competitors for the weekend arrived and got into the water. Holly Bassett impressed a lot of surfers, she made it out back in the big conditions and proceeded to pick off some bombs as the sets came in, and at only 14 years old! Saturday morning dawned and the contest began. There were no other surfers or SUPers out and I was in the first heat of the day, it was hard to tell from the beach how big the swell was, but it was windy with a short interval. We paddled out and quickly discovered it was not going to be an easy day, it took me 20 minutes to get out (and I still was not all the way out back) and I had not had a single wave. Taking the easy route I decided to catch two reforms on the inside to get some scores on the sheet. It was enough to make it through to round two. Matt Argyle and Gareth Grant get ready to paddle into Heat 1, Round 1. Photo Bob Berry. While I waited for round two to start I had a good chance to look at the other SUP surfers. What is really clear is that the standard this year has taken a quantum leap. There were some big moves being busted, aerials, slides, big cutbacks and slashes. The style has completely shifted from longboard to short board, although SUP has that rather unique hybrid where at one moment you can smash the lip, and the next you can nose ride. The conditions had not improved in round two. Overhead, short interval swell with strong onshore winds. This time I planned my assault and found a rip to take me outback. I managed to get a couple of nice sized waves and a couple of reforms and that was that, through to round 3! The boards ready to go, photo Simon Bassett. This time the swell had increased again. Competitors had been given an extra 10 minutes before the start of the heat to paddle out, myself and John Harvey used it wisely to find another rip and get out back. The swell was increasing outback and coming in sets of 20 or so. It was quite erie to be paddling up the face of these monsters waiting for the heat to begin. As soon as the heat started a set came through, I dropped into one of the biggest lefts I have ever SUP surfed. I went back hand and after the bottom turn and the beast was starting to section. Not wanting to get caught I floored the accelerator and made for the clean section, which I just made. Being as I had made it out I decided to continue riding this wave all the way in, which resulted in a score in the eights which was nice. John was ripping, and managed to bag a big score (I heard it was a perfect 10) and we both went through to round 4. There was some talk of delaying round 4 till the Sunday, but it was decided to push on. Unfortunately I had nothing left I the tank, so I decided to withdraw and get back into the hot tub, while the other 15 competitors surfed in the challenging conditions. The quarter finals were delayed until Sunday and everyone retired to the bar to recover. Sunday dawned to absolutely perfect conditions, a gentle off shore and a nice 4ft swell running. I got straight out for a free surf which was amazing, a lot of the other guys joined in. It was decided to run the battle of the paddle first, I saw John Hibbard take his race board down to the beach, then change his mind and go for a surf instead. It was that good. Battle of the paddle on the way out, photo Bob Berry. While enjoying the waves we watched the racers, Charlie Grey did an amazing job to win the 12ft 6″ race category with plenty of competitors tight on his tail. Matt Smith did took the 14ft category. The juniors then entered the water for their final. Arron Rowe blew minds with his surfing and got the first, but the two younger SUPers Ollie Laddiman and Louie Harrow showed that they were no light weights in the surf, getting some nice waves. These guys are the future of our sport, and the future looks good. Arron Rowe gets inverted. Photo Bob Berry. Ollie Laddiman, Photo Bob Berry. Louie Harrow, photo Richard Davies, Farscapes. The ladies then had their semi finals, with some controversy on the judging. Watching from the beach it was clear who had done well, but the judging sheets did not reflect it. In the ladies final it was clear that Marie Buchanan was going to fight hard to win this one, which she did, but Abi Barker Smith was hard on her heels. By this time the wind had switched back to onshore, destroying the clean waves and turning them back into mush, but that did not stop the men’s quarter finalists who worked hard to progress in the semis then the final. The Ladies Finalists. Photo Bob Berry. Jim Richardson, Andre Le Geyt, Arron Rowe and Titou Minster made the final a Wales vs Jersey affair, from the off it was clear that this was going to be a fiercely fought affair, with Arran hungry to pull all the moves out of his trick bag, but in the end Andre’s consistent wave selection and devastating cut backs won the day. Jim surfed really hard and got some great waves, taking second place. Titou was unable to find the waves to give him the good scores, which is a shame as he is a really aggressive SUP surfer and a joy to watch. Winner Andre Le Geyt – photo Richard Davies, Farscapes. Jim Richardson – Photo Bob Berry. Arron Rowe gets airbourne – photo Richard Davies, Farscapes. Titou Minster ripping, Photo Bob Berry. 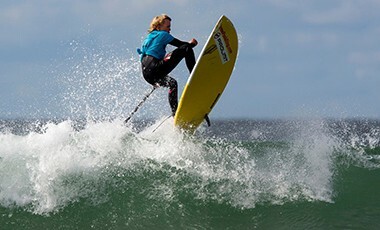 Andre le Geyt also won the overall Watergate Bay Waterman award. “The contest was one of the toughest I’ve ever done with testing and variable conditions but also, when you got them, some great waves !! It was great to see the high standard of surfing and determination shown by everyone who took part. Its motivated me to keep pushing my levels!! Watergate bay is a stunning bay one of the nicest I’ve been to anywhere, with great waves and almost amphitheatre like qualities especially when your sat in the hotel bar enjoying the view with a well earnt beer after a good days surfing !! So there we are for another year, there was a lot of talk about putting on a 3 or 4 event surf series next year, lets hope it happens as there is a competitive demand for SUP surfing events. Matt Argyle enjoying a free surf – photo Richard Davies, Farscapes.